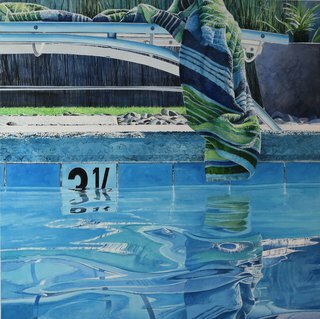 "Through the medium of transparent watercolor, my work explores everyday and mundane objects and places in the built and natural environment, tightly editing the composition to evoke the power and clarity of simplicity. Walls, shadows, edges, buildings, landscape and flat surfaces together with strong sunlight all interest me to create meaningful images where the ordinary becomes complex, poetic and memorable. Represented by SFMOMA Artists Gallery, San Francisco, CA. and Skidmore Contemporary Art, Santa Monica, CA.